1. Add jQuery in your page (if not added) in HTML head tag. 2. Add XFBML (if not added) in HTML head tag. 3. login to Google CSE and get code of your custom search engine. In your code you will see customSearchControl object. 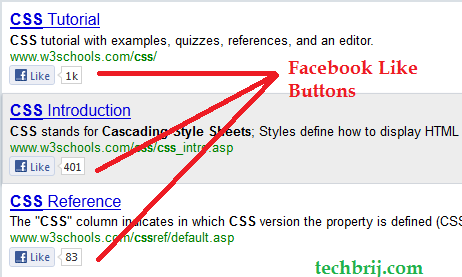 Similarly, you can add twitter, Google+, linkedin buttons also. Hope, you enjoy this. Thanks @labnol. Is there an updated version of this tutorial? hi…I implemented and it used to work fine but suddenly now the fb like button doesnt show up anymore? Can you suggest anything? In which page I have to add coded under number 1 ,2 & then at 4..
Like amazing tutorial thanks for sharing. Good Job…need your help to design a other custom search engine…..